Add freshness and flavor — and an extra dose of nutrition — to your favorite pantry staples. The key to convenience is to choose wisely. Look for nutrition-positive ingredients, like whole grains, beans, nuts, fruits and veggies, and compare labels to find foods with the lowest amounts of sodium and sugar. Though packaged foods can be fine on their own, I also love adding freshness and flavor — along with an extra dose of nutrition — with some staples I have at home. For instance, I always have pre-washed baby spinach in the fridge, and it instantly adds color and disease-fighting compounds to canned lentil soup. For more quick and easy inspiration, I turned to national nutrition experts to get their tips for making a “meh” meal instantly more enjoyable and nutritious. As a dietitian, it’s hard to bless boxed mac and cheese, but Jessica Levinson, MS, RDN, CDN, culinary nutrition expert in New York, suggests boosting the protein and fiber with frozen, shelled edamame beans. 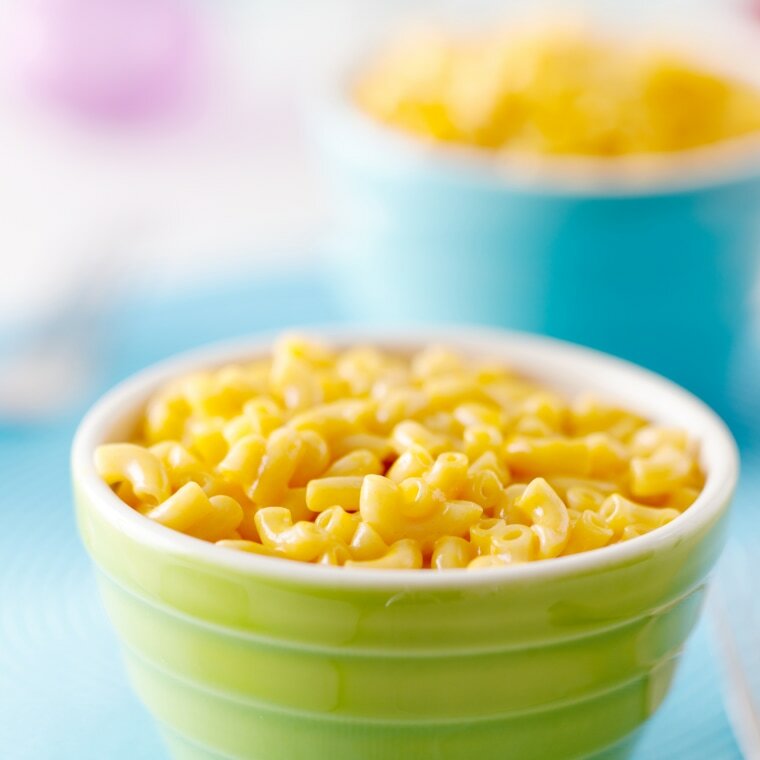 This tip gets your mac and cheese across the finish line! Stocking edamame in your freezer means you can punch up the protein, fiber and protective compounds in many dishes. Because soy foods, like edamame, contain an estrogen-like compound, many women remain fearful of its link to breast cancer. Rest assured, the American Institute for Cancer Research reports that one to two servings of whole soy foods (like edamame and tofu) a day do not raise the risk of breast cancer — even among survivors of the disease. If you don’t have frozen edamame handy, you could add frozen peas, or go another route with frozen broccoli or cauliflower, both of which offer cancer-fighting compounds. I always have hummus on hand, whether to enjoy as a spread or a dip. A bean-based food, hummus is a fine choice on its own. It can boost your diet quality by providing a slew of nutrients, including protein, fiber, B vitamins and healthy fats. Still, you can hack your hummus or add it to other foods to bring more nutrition to your meal. Kara Lydon, RD, LDN, RYT, Intuitive Eating Counselor and Blogger at The Foodie Dietitian, adds hummus to savory squash soups like sweet potato, butternut squash or pumpkin bisque. “It's an easy, plant-based way to add creamy texture and consistency to your soup while boosting it with nutrients like fiber, healthy fats and plant-based protein,” she says. Hummus happens to be dairy-free, making it a great way to add creaminess whether you’re avoiding dairy or just looking for a nutritious alternative. Cynthia Sass, MPH, RD, New York City-based author of Slim Down Now, turns hummus into a superstar dip by adding finely chopped veggies, like red pepper or kale. For those days when dicing veggies feels like a chore (I admit, I’ve been there!) pre-shredded carrots — available in every major grocery store — would be an easy stand in. Keeping a few of these in the freezer means you won’t have to turn to takeout, fast food or other less healthy fare when you need a meal ASAP. If you haven’t shopped the frozen food aisle in a while, you’re in for a surprise. You’ll now see meals with reasonable amounts of sodium, whole grains, veggies and tons of flavor. Nuts are another great way to take frozen entrees up a notch. Roasted cashews make a nice topping on Asian entrees while toasted pine nuts (which can be “toasted” in the microwave) add crunchiness to frozen pasta entrees (which, let’s face it, are sometimes soggy). Another bonus: Nuts add healthy fats, which make frozen entrees more filling. I dare you to find a dietitian who doesn’t have this in the fridge! It’s not exactly the type of packaged food that needs a nutritious boost, but I had to include it since it’s also an easy addition to other convenient fare. Baby spinach is one of the best sources of beta carotene around. Studies link this antioxidant to many health perks, ranging from reducing your risk of age-related macular degeneration (the leading cause of blindness) to improving your appearance by giving your skin a sun-kissed glow (minus the sun’s damaging rays). With the ease of bagged or boxed pre-washed baby spinach, it’s no wonder this veggie is a go-to for dietitians everywhere! Madison, WI-based chef, Julie Andrews, MS, RDN, CD, owner of The Gourmet RD, suggests topping pizza with sautéed spinach. Whether you’re picking it up from the local pizzeria or turning to a frozen variety, it’s a clever way to add veggies. I add baby spinach to just about everything. Not only does it amp up the health factor of convenience foods, it adds a pop of color to soups, brown rice and whole-wheat pasta. Baby spinach has a mild flavor, so it’s also nice blended it into your favorite smoothie recipe. This inexpensive whole grain is an exceptional source of cholesterol-lowering soluble fiber. Oats are also higher in protein and lower in carbohydrates than most other whole grains, according to the Whole Grains Council. However, the flavored versions typically pack in lots of sugar, so stick with plain oatmeal and add flavor with these nutritious hacks instead. Julie Harrington, RD, culinary nutritionist of RDelicious Kitchen in Morristown, NJ, suggests stirring in some canned pumpkin puree and nuts to plain instant oatmeal. “Pumpkin is packed with fiber and vitamins A and C, while nuts will provide additional fiber and healthy fats to help keep you full,” she explains. Bonnie Taub-Dix, RDN, creator of BetterThanDieting.com and author of Read It Before You Eat It, recommends stirring almond butter into oatmeal for an easy upgrade. “Adding protein and fat to carbs like oatmeal helps keep you satisfied and helps smooth out blood-sugar levels,” she explains. Combining oatmeal with a few other convenience foods can turn this traditional breakfast into a savory meal. Try cooking it in reduced-sodium chicken broth and stirring in frozen peas. A sprinkle of Parmesan cheese adds more zip as well as some bone-building calcium. Rather than whipping up a batch of marinara sauce, many of us turn to the jarred variety, and there’s no shame in that! Look for varieties with little, if any, added sugar, and compare labels to find a lower sodium version. Though pasta sauce is rich in the antioxidant lycopene, food pros suggest stepping up the nutrition with these kitchen tricks. "One of my favorites things to do is add white beans and peas to jarred marinara sauce. The end result is a nutrient-packed sauce to place on top of your favorite pasta," says Keri Gans, RDN, based in New York City and author of The Small Change Diet. As a dietitian, I’m armed with tips like these, but I also get by with a little help from my friends. I like to stir hummus into my marinara sauce — a tip I probably stole from Keri Gans, who does the same thing!